Virgil Van Dijk's first Champions League goal helped Liverpool to a 3-1 Champions League victory over Bayern Munich that secured a place in the quarter-finals. The match, which followed a goalless first leg, was finely balanced after Joel Matip's own goal had cancelled out Sadio Mane's brilliant opener. But Van Dijk, so influential in defence since his £75million signing, proved how valuable he can be at the other end with a towering far-post header for his third goal in four matches - more than he had scored in his previous 55 appearances. 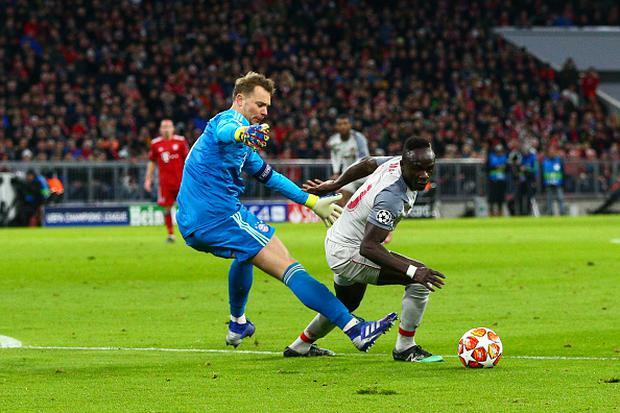 It broke Bayern's resistance and, as they went chasing the two goals they needed for victory, they were picked off with Mane's late diving header ending a run of five Champions League defeats away from Anfield. The leadership of Van Dijk, suspended for the Anfield tie, was critical as he and Matip kept the competition's leading scorer Robert Lewandowski at arm's length. It was made all the more urgent to do so after Liverpool lost their captain Jordan Henderson to injury after 13 minutes. Henderson was part of a midfield trio, including James Milner and Georginio Wijnaldum, which had lost the last three European matches it started: last season's semi-final and final against Roma and Real Madrid respectively, and Paris St Germain in the group stage in November. But while his midfield was somewhat predictable, boss Jurgen Klopp swapped around his forward line for the start with Mohamed Salah, usually right-sided, and Mane swapping flanks. Less than seven minutes in Henderson required treatment on his left ankle; Roberto Firmino dropped into midfield but his carelessness on the edge of his own penalty area saw Thiago Alcantara whip a shot over. Henderson did not last much longer, with Fabinho replacing him after 13 minutes. By then referee Daniele Orsato had already waved away penalty claims after Van Dijk tangled with Lewandowski. Salah, having switched back with Mane, lifted a ball forward for Firmino to shoot wide before the crucial away goal came from a touch of brilliance by Mane. With the ball heading towards the Senegal international on the edge of he penalty area, Manuel Neuer made a decision to close down the forward and got caught hopelessly out of position as Mane's smart turn allowed him to embarrass the Germany goalkeeper, clipping a left-footed shot into an empty net. It was Mane's ninth goal in his last 10 games and he equalled the club record of Steven Gerrard and Firmino of scoring six away goals in this competition. Neuer was put under more pressure by Andy Robertson's angled drive but it was the Scotland defender who was the one caught out as, almost from nothing, Serge Gnabry got in behind him and fired in a cross Matip could only turn into his own net with Lewandowski waiting to pounce. Bayern's pressure leading up to half-time dissipated after the break as the game became more end-to-end. And while Klopp had said pre-match an open game gave them the opportunity to win, the dynamic had changed sufficiently with an away goal on the board that a more disciplined approach was required by the visitors. But with Neuer's judgement still looking suspect after failing to hold onto Salah's shot, Liverpool sensed they had the chance of a second - even after Gnabry's cross had flown through the six-yard area unchallenged. The critical breakthrough came in the 69th minute when Van Dijk rose highest at the far post to head home Milner's corner. Even with the lead Liverpool continued to take the game to their opponents as space began to open up and Mane took full advantage with a diving, far-post header to convert Salah's sumptuous outside-of-the-foot cross.